March 10, 2014 at 12:00 pm Add a comment! This week is all about the Den A/V system here on DIYSarah.com. To start out, I want to show you a product I love that just works and does 90% of the heavy lifting in our A/V system. 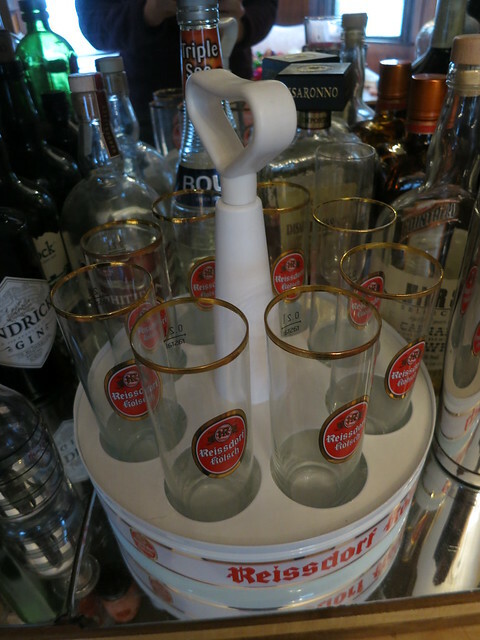 We have 2 of these and they are AWESOME! We started with an Apple TV but after switching from Netflix to Amazon Prime for our streaming source, we needed a data streaming device that would work with Amazon Prime. The roku is $100 and basically turns your TV into a smart-tv. You connect either to ethernet or to your wifi network and the roku handles all the content streaming. We upgraded from the Roku 2 to the Roku 3 because the 2 didn’t have youtube and we watch a couple youtube channels regularly, namely Crash Course which airs 10-15 min history and science videos weekly. They are VERY well done, funny, cute, and interesting. We also like CGP Gray whose videos are well-researched factoid type videos that focus on european geography and geopolitics. Zefrank1 makes funny animal videos and just has a great brand of humor. My absolute favorite video by him and maybe of all time is this one. I mentioned the Roku does Amazon Prime streaming but don’t worry, it also does Netflix and a host of other streaming applications including Crackle and Pandora. It’s great to be able to turn on the TV and stream pandora without waiting for a computer to load or setting up any speakers loud enough to hear. The TV has all of that and the Roku makes it possible. My most favorite feature of the roku is the remote. It isn’t some outdated IR remote, it is bluetooth so it works no matter what direction you are pointing it. It even works under the covers if it is too cold to un-snuggle to change the channel. This is an actual problem I deal with so bluetooth – yes. Let me just take a moment to rant about IR remotes. Um, hello…it’s 2014…IR remotes have been around longer than I have. IR remotes have been around longer than TI-84 graphing calculators and lets talk about outdated hardware! If you need to send data from object A to object B there are about a million ways to do it that don’t require you to line up a narrow beam of light with a narrow sensor angle. Why, WHY!! do 99% of the DVD players I can buy on amazon right now use an IR remote. Ok, rant over but really, why? So the point of all this is that a Roku is quite a bit cheaper than upgrading to a smart-tv, it streams amazon prime which the appleTV does not, and it has a bluetooth remote (the apple TV does as well). For $100 you can have it in 2 days and be streaming in no time. Awesome! After the Christmas decorating rush, I took some time to go through some more of the many many bins in the basement. Most were filled with china of one variety or another. 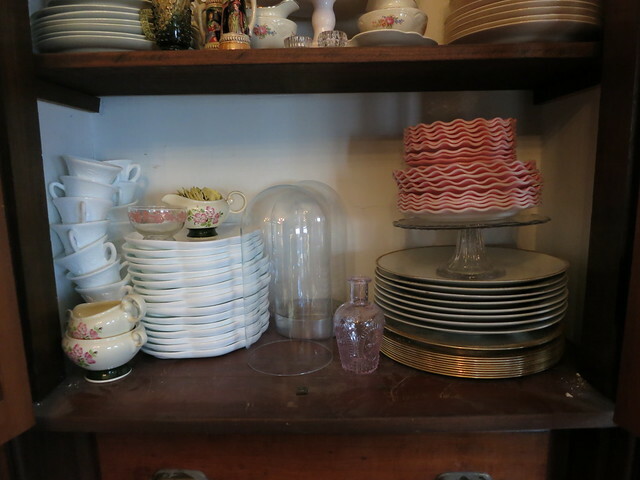 I’ve unpacked most of it and have started arranging it in my china cabinet built-in in the dining room. This set of China I purchased for myself as a wedding present of sorts. It’s Homer Laughlin and not super rare or valuable but I love the scalloped plates, the cream background, and the gold trim. Very sweet and girly. 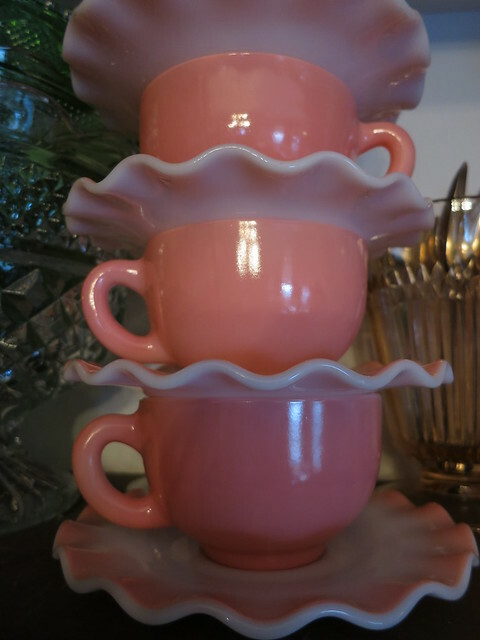 I got a service for 12 give or take with many fewer cups and saucers which is really a blessing in disguise. I’ve also got a toureen with a broken handle, a gravy boat, cream and sugar, soup bowls, dessert bowls, dessert plates, salad plates, and dinner plates. It’s a huge set and I’m so glad I picked it up when I did. 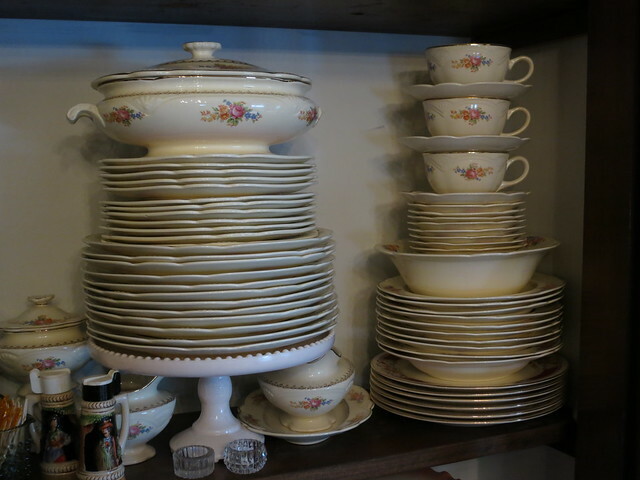 I’ve got the plates propped up on a cake stand which is a great trick for filling up a china cabinet. It gave me more room on the shelf for the little stuff. 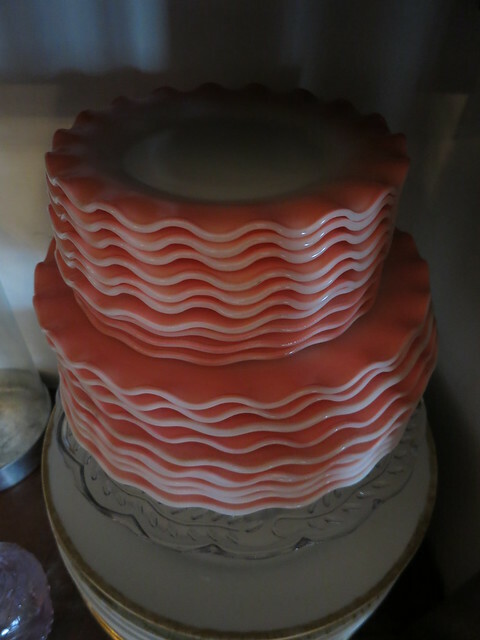 The other set of china that I’m super proud of is my pink ruffle. I picked up my first set of 4 at a local antique place. I fell in love and couldn’t leave without it thought I believe it was super cheap – like $12 for a service for 4. The bowls had been stolen so she had it discounted. I bought the second set in Houston somewhere and when I saw it, I again wasn’t leaving without it. I’ll be collecting pink ruffles forever I’m sure and I’ve picked up a few single pieces here and there when I see them. It’s just so striking and adorable. I love it! It’s not marked but the research I’ve done indicates it is from the 1940s. The display still has a ways to go but talking about the display cabinet wouldn’t be complete without mentioning the milk glass snack sets. Yes, that is a lot of snack sets and no, that isn’t all of them… They were my grandmothers. I have 40 something sets. They have been moved across the country and back several times and whenever I see them I just think to myself that I am just as crazy as Gram was and I couldn’t be prouder. When she died and we were cleaning out her stuff, it was like Mary Poppin’s carpet bag. You just couldn’t understand how so much stuff came from such a small place! The same is true with me I think. I’m really good at storing my things and knowing where I’ve stashed them. 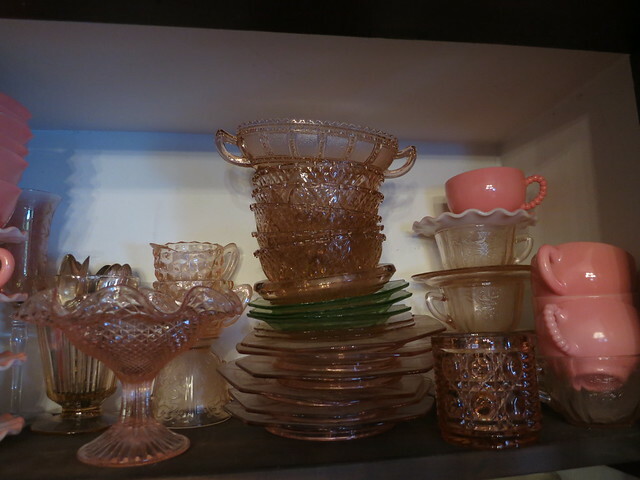 The top shelf in my china cabinet is currently filled with pink depression glass. I’ve got a small collection going but it isn’t displaying as well as I would like. I need to work on it some more and see what I can do. The only bins filled with breakable things left in the basement are filled with “Koala and Nonny Figurines” (Nonny was my great-grandmother) and my punch bowl and cups. Just a bit more unpacking to go and then we’re going to need to figure out what to do with my book collection…. Are the walls in your dining room painted a light green? The back of your china built in needs a color. You might think about painting it that light green or even another color. Your china will look so much better. I’m so happy for you. Can’t wait to see it. Enjoy! Agreed. I used up all the green paint for the dining room so I need to get another can before I can paint the china cabinet. I half considered covering some posterboard with fabric and sticking them in. Maybe a nice stripe? 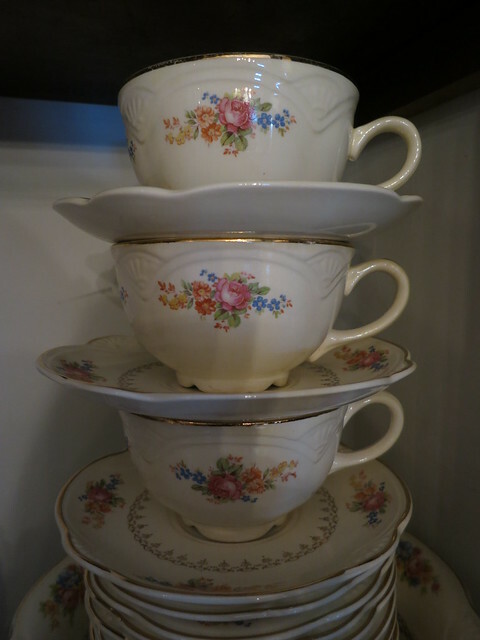 Then again, I have so much china it may just be too much. December 31, 2013 at 12:42 pm Add a comment! 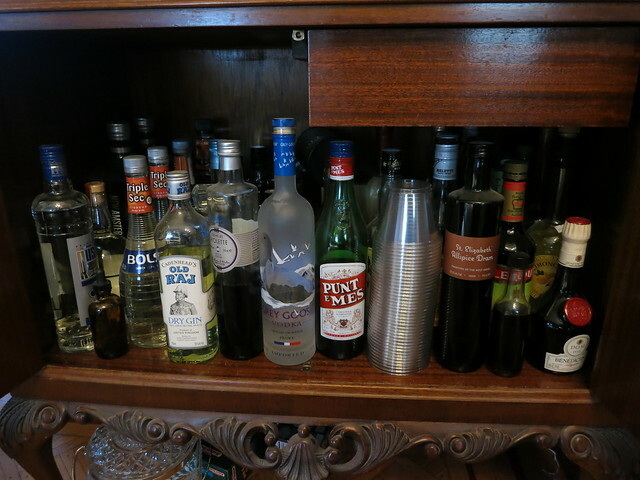 Since it is New Year’s Eve, I’ve decided to show you our liquor cabinet and give you some ideas for yummy champagne cocktails. 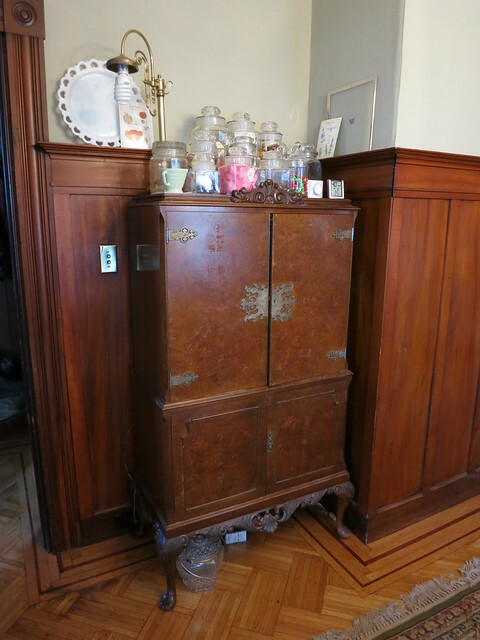 I believe I’ve shown you this cabinet before here. We purchased it for $100 at an estate sale and I’m so glad we did. Now that the floors are refinished I can finally start arranging the furniture in the house! Yay furniture. 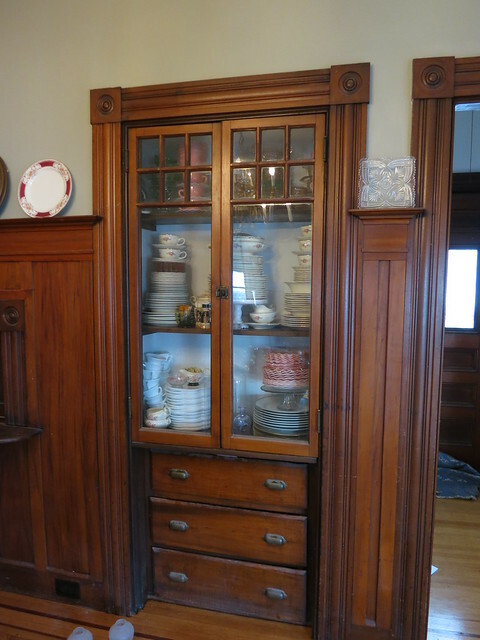 The bar cabinet fits perfectly in this nook in the dining room. We have a lamp on it at the moment but I don’t think it will be there permanently. It was a last minute addition to hang the chandelier in the room so the lamp was a practical addition to the room. On top of the cabinet, I have my collection of jars. They aren’t filled or arranged yet but they will fill up with time I’m sure. I’d like to put my punch bowl up here and put the jars in the Den but the den isn’t quite to that point yet and the punch bowl is all packed up still so jars it is. 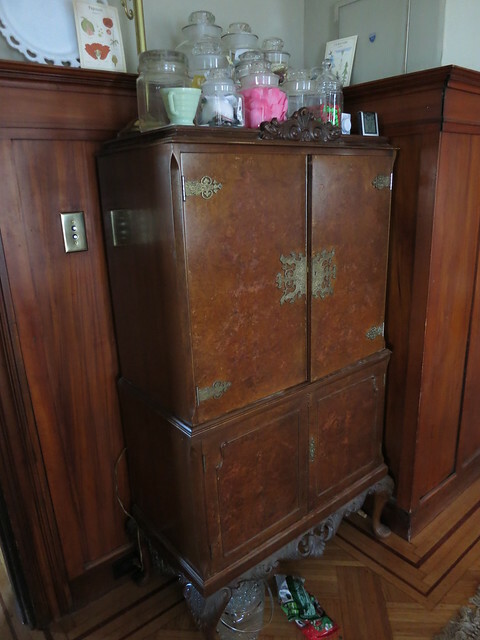 The outside of the cabinet is this beautiful burl veneer. And the inside is a gorgeous maple. This odd-looking contraption is called a Chandelier and the glasses are called Stagen which is german for Pipe. When Stefan and I traveled to germany, we went out into the suburbs of Köln (Cologne) to visit this Brauhaus. It was our favorite beer of the trip. 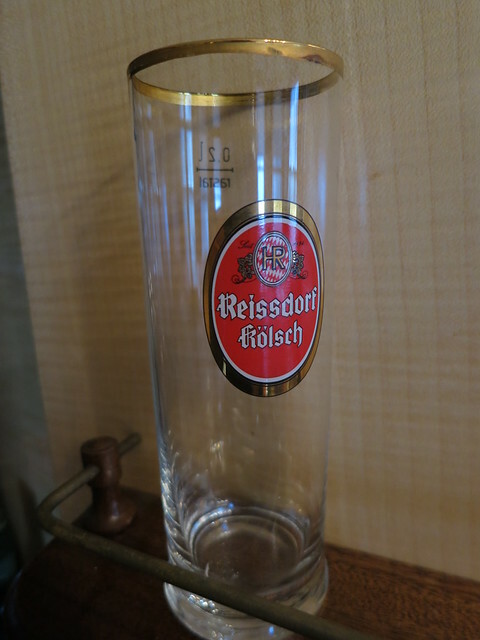 Kölsh style beers are always served in these little 0.2 L glasses and each one typically costs 1 Euro. They mark on your coaster how many you’ve had and the waiter comes around with the chandeliers filled with glasses to serve you. We served Riesdorf Kölsh at the wedding and ordered the glasses and this chandelier. I’d like to display the chandelier better. 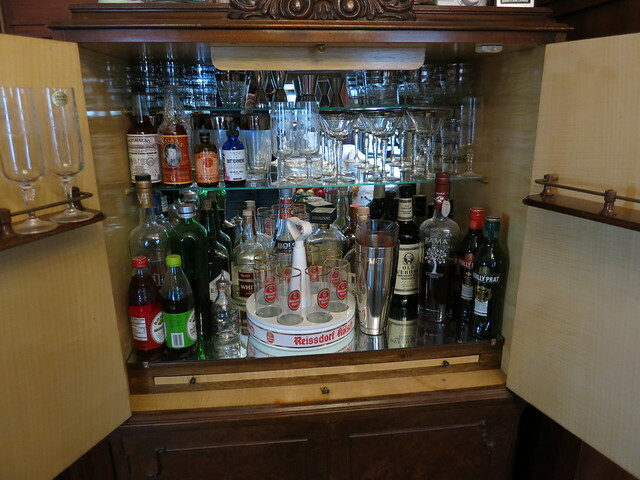 It is a great centerpiece with flowers in each of the little glasses but for now, it is in the cabinet. I mentioned Champagne Cocktails. I love me some Champagne Cocktails. Lets start with a Sarah Specialty – the Poinsettia. We served these as the signature drink at our wedding. 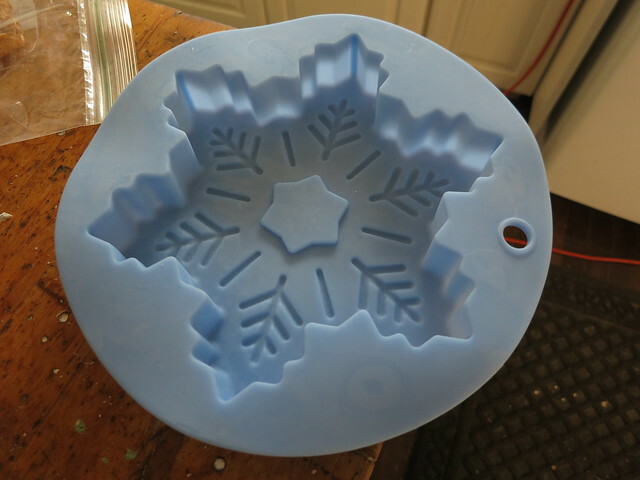 For our Christmas party, I found this great silicone snowflake mold and made some awesome ice cubes. I tossed some frozen strawberries and cranberries in the mold, topped with water, and threw it either in the freezer or outside until frozen. Super cute and easy! This is basically alcohol with more alcohol as a mixer…dangerous and delicious. I hope you all have a festive, safe, and happy new year! In the first floor entry, dining room, and piano room, we are having the ceilings re-done. 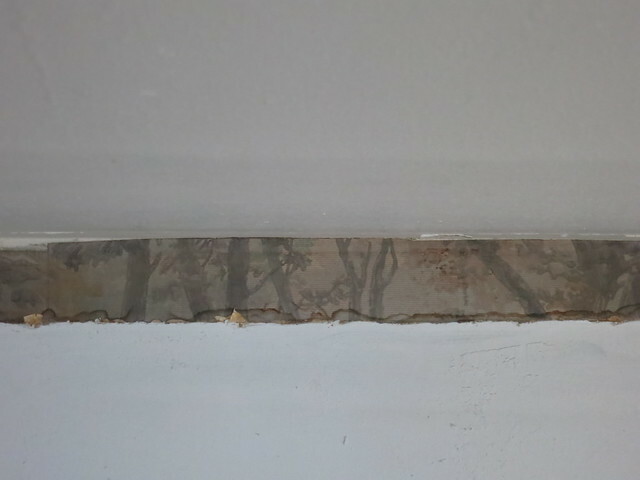 We have a plaster guy that is going to put up 3/8″ blue board and plaster over it to tighten up and clean up the ceiling. Before we can get that crew in, the crown moldings needed to come down. The crown in the entry and piano room was a picture rail molding that wasn’t installed or stained particularly well. 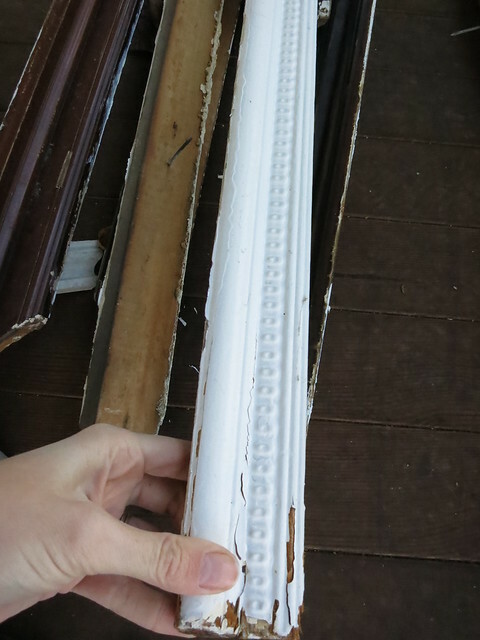 We’re planning on upgrading the moldings to something a little more substantial. We also are having Tate’s Coating come out and spray insulation under our floors. 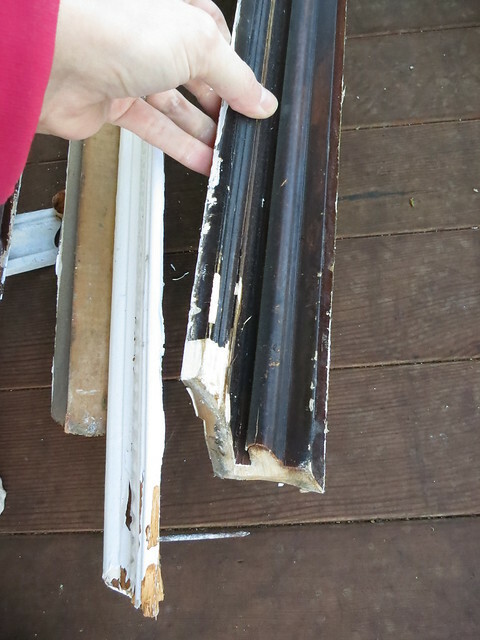 Here are the picture rail moldings stacked up on the porch. You can see they were in rough shape and would have needed a fair amount of work. Since the ceiling is being re-done, it was a good excuse to ditch them and start new. There is the neat hand painted forest/tree paper. Very much back in style and great colors! 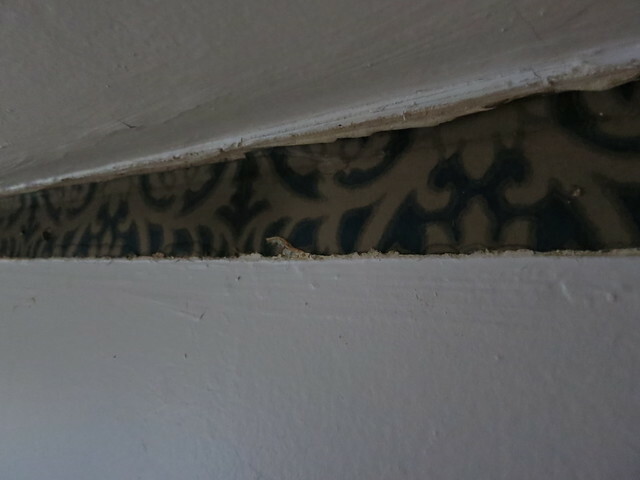 In the dining room, there was a painted moldings that really was quite pretty. I do think it’s time to upgrade to something a bit more substantial to show off my tall ceilings but it really is sweet molding. Under that trim, was this bold graphic pattern in navy and gold. Again, very much in-style with the stenciling craze these days but decidedly too dark for the room. If the entry still had the trees, I might have kept it but that navy print would have had to go. I’m still working on scheduling the plaster guys but I’ll keep you posted!